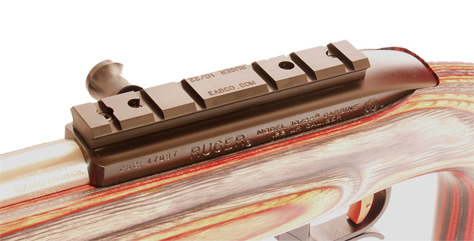 Our EABCO Ruger 10/22 Scope Mounting Base is precision machined to optimize the base for the very best ring engagement, alignment, and rigidity. No molding or extrusion process can match the precision machined quality of this 10/22 scope base. Slots are exactly and properly dimensioned. Bevels fit rings and attachments with no slop. There's no warping or curving... When you hold one of these bases, you can tell the superiority immediately. In fact, this mount is precision machined to EXCEED Weaver style quality and fit. It's finished in matte black or silver and mounts with four screws (included). 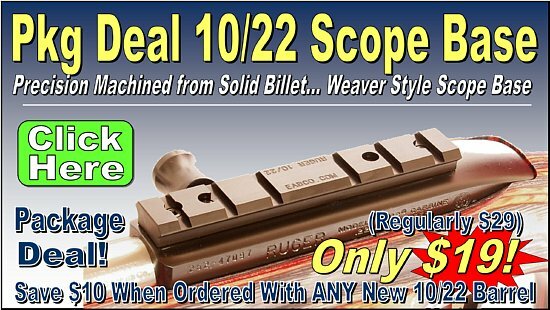 Click Here to see all of our Ruger 10/22 Scope Mounts and Scopes! PACKAGE DEAL: Take $10 Off When You Order This Mount With Any New 10/22 Barrel! This is the second one I bought, can't go wrong! Precision machined and fit the receiver perfectly. Spent extra money on this instead of getting the usual 10 dollar weaver rail. Glad I did, that little rifle is a tackdriver. As promised, the base showed up quickly and fit like a glove. Thanks big B for your professionalism. Excellent product will definitely use on future builds. Decent price and great quality.